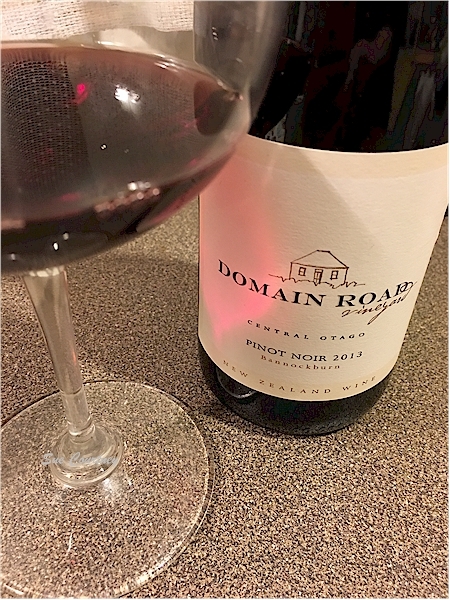 Domain Road Pinot Noir 2013 is from the Bannockburn subregion of Central Otago wine country, South Island, New Zealand. It costs about NZ$38 a bottle. Colour: Ruby with flashes of purple. Bouquet: Sensuous, savoury, smoky – sweet woodsmoke – rosehips, cherry and red plum jelly. Palate: Earthy, savoury and gamey with touches of ironstone – red stone. It’s firm upfront with fairly dry feeling slightly grippy tannins that eventually meld into the succulent cherry and red guava fruit with well balanced acidity drawing out the finish. It seems more savoury, more brooding, more grippy than many CO pinots and I wonder if there is Gibbston fruit but no, it’s all from Domain Road’s vineyard in Bannockburn. Four years old and still a baby. I reckon it’s going to be a long-lived wine. For more tech info on the wine and where to buy check out the Domain Road website. This entry was posted in #nzwine, bannockburn, central otago, pinot noir and tagged 2013, Domain Road by Sue Courtney. Bookmark the permalink.